The parish register containing the entry recording the marriage of Admiral Lord Nelson has been brought to the UK from its home in the Caribbean for urgent conservation work. The 190-page register is held in the parish church of St John Figtree on the island of Nevis, where the then Captain Horatio Nelson married Mrs Fanny Nisbet, the widow of an island physician, who later became Viscountess Nelson. The marriage took place in the parish on 11th March 1787 at Montpelier House, the residence of the President of the island. At that time, Captain Nelson was commanding the British warship, HMS Boreas, protecting British interests in the north east Caribbean and especially enforcing the Navigation Act recently passed by the Parliament in the UK. 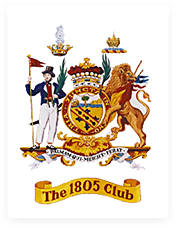 Early in 2016, The 1805 Club, a UK-based charity, which conserves and maintains monuments, graves and artefacts of the sailing Royal Navy of the Georgian era, was made aware that due to long exposure to the humidity and high temperatures in the Caribbean, the condition of the register had deteriorated badly and was in urgent need of conservation. The church in Nevis is within the Diocese of the North East Caribbean and Aruba, and permission having been granted by the diocesan Bishop and his Chancellor, the Club announced it would bring the register to the United Kingdom for conservation. The work is being carried out by the world-renowned Borthwick Institute, part of the University of York and the repository for the archives of the Archbishopric of York. This Institute has long experience in conserving church documents, including church records up to 800 years old. It is expected that it will take the Institute at least 18 months to complete the conservation work on the parish register. Chancellor of the Exchequer in 2017 out of the fund derived from the LIBOR fines of over £100 million. This fund was set up by the Chancellor to support Armed Forces charities, and other related good causes. The provision of a series of naval lectures for Royal Navy personnel delivered by university academics. The acquisition and hosting of two Royal Naval historical databases that contain the biographical histories of officers who served in the Royal Navy during the Napoleonic Wars and the other giving similar details of officers and men who served in the British ships at the Battle of Trafalgar. A third database to be hosted by the Club comprises data on memorials, tombs and artefacts relating to the Georgian sailing navy. Restoration of the Anglican chapel at the world’s oldest Royal Naval Hospital located at the Isla de Rey, an island in the centre of Mahon harbour, Menorca. Provision of one day Wooden World school workshops, for Key Stage 2 and 3 students, which are about the sailing navy of the Georgian era.